1. Make lists of what populations you feel called to serve, where you would consider serving, what you like to do, and what you are good at doing. Research where these lists overlap. This is similar advice to what my father had me do when applying to programs. His categories were what do I like, what am I good at, what can I make money doing… However that last category doesn’t really apply to volunteer work. More appropriate perhaps is to ask yourself who do you feel called to serve within the poor and vulnerable and where would you like to be serving. By naming four or five things on each list, you can begin to piece together where your answers overlap and research organizations that meet the qualities you have identified. 2. Consider what would be an absolute deal breaker for you. Service is about sacrifice, but there are some sacrifices that may prevent us from serving to the best of our abilities. Be sure to take these into account when narrowing down your possible service organizations. For example, if living in community with local people will be distracting to you or take away from your service experience somehow, take that into account when considering where you would like to apply. 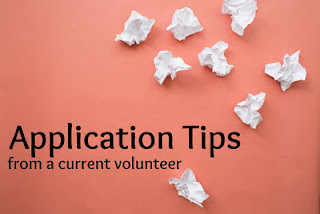 If you happen to be accepted into a program that meets nearly all of your desired qualities but has one glaring downside (perhaps location or work placement), don’t be afraid to turn it down if you feel it will detract from your ability to serve. 3. Imagine getting accepted into every program you’ve applied to – which program would be the hardest to say no to? After I had been accepted into one of my top two programs and was waiting to hear from the final interview results of the other, considering which would be the more challenging to turn down helped me make my decision in the end. I couldn’t imagine saying no to the program that not only offered me everything I was looking for, but also allowed me to give back in the ministry in which I was hoping to be involved. In the end, I imagined telling my parents and friends that I had accepted or rejected each option; I imagined their reactions when I told them I had turned down either of my top programs. By picturing them reacting, I was able to decipher where my heart was truly called based on my treatment toward each program in discussion with my closest companions. Overall, discernment is your best friend! Pray about this decision. Discuss it with those who know you best and those who know the programs you are considering best. Remember, there is no need to feel guilty about turning down an offer in favor of something else. Sara is a current Echo volunteer/student through the University of Notre Dame.To learn more about the Echo Program, please click here. This post was made as an extension to our Application Tips From a Current Volunteer blog series. Please check out our first blog post here.